As we all know, the stock market has been on a tear, recently rising to all time highs. This reflects overall strength in the economy as well as a favorable yield status for the U.S. dollar. As we have made these recent highs several of the measures of strength that I track have lagged. I refer to this as a yellow light, rather than an outright red one, if for no other reason that these divergences can persist for quite a while before they turn into significant price weakness. My general experience has been that, the longer the divergences, the more pronounced the subsequent market decline. This was certainly the case in 2000 and 2008, where market rises became increasingly selective until the overall market dropped. 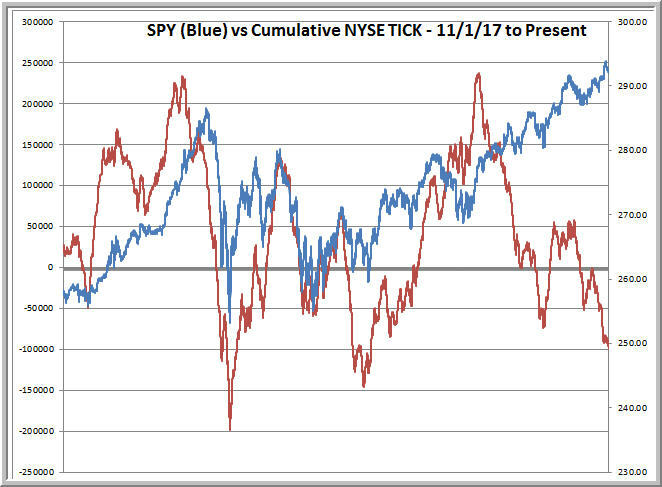 Above is a chart that tracks five minute closing values of SPY (blue) versus a cumulative line of upticks versus downticks among NYSE stocks. (See this post for background). When we have more stocks trading on upticks, that reflects underlying broad buying strength and vice versa. Note how the cumulative TICK has been declining now for a while. 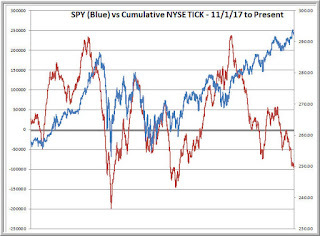 This reflects relative weakness among the smallest of the NYSE universe. We see this relative weakness in the recent underperformance of the NASDAQ and Russell indexes as we made the recent highs in SPX. Many sectors within the SPX also failed to make new highs for the year, including XLF, XLE, and XLB. Even more pronounced has been the relative weakness of overseas equity markets, many of which have been in downtrends since January. See, for example, EEM and EFA. Quite simply, stock market strength around the world has waned since January and has begun to wane in the U.S. As a result, the market rally has become increasingly narrow. Indeed, in the last 13 trading sessions, only 4 have seen more stocks across all indexes making new one-month highs versus fresh one-month lows. As I've mentioned in the past, a rising tide lifts all boats. When boats aren't rising, it's worth questioning the tide. Updating market strength and weakness is a way of staying flexible in our expectations and being prepared for multiple market scenarios.